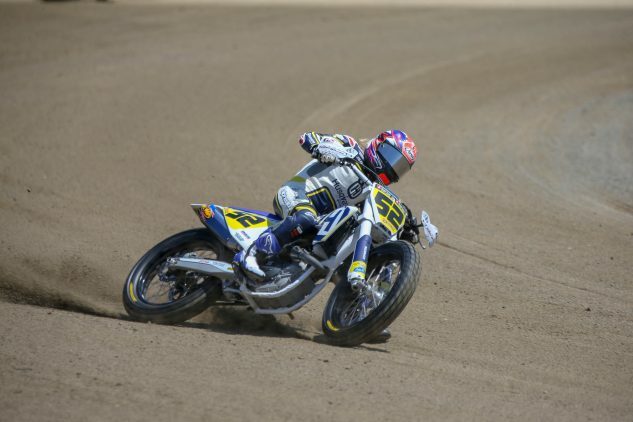 Shayna Texter, the all-time win record holder in the AFT Singles class, won Husqvarna its first ever American Flat Track Race, and in convincing fashion, no less, beating all the boys. LIMA, OH – July 1, 2018 – Grand National Champion Jared Mees has racked up 18 Main Event victories during his historic run these past two American Flat Track seasons. Saturday’s win at the Indian Motorcycle Lima Half-Mile, however, may just be the sweetest of all. Mees rode like he had a point to prove. 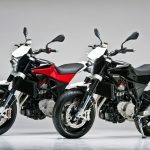 Last year’s title triumph saw Mees finish on the podium in all but one AFT Twins presented by Vance & Hines Main Event. However, the “one” came in the race he wanted more than any other. 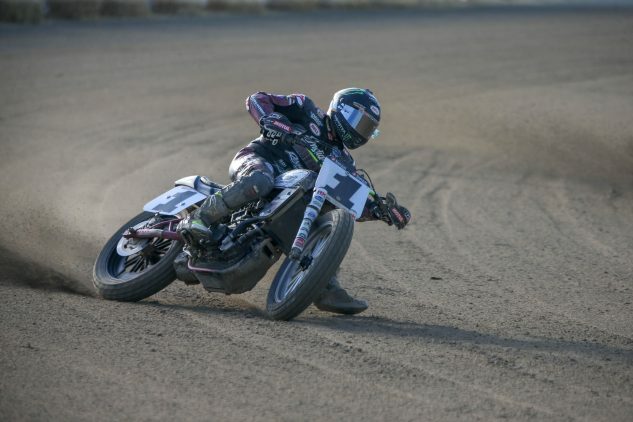 Serving as the race promoter of his home race on exactly the sort of demanding track Mees likes to point to as a measure of a rider’s ability, he failed to even qualify for last year’s Lima Half-Mile Main due to penalties incurred for jumping the start of his semi multiple times. Being forced to swallow that bitter pill in 2017, Mees took full advantage of his rare opportunity for redemption at the Allen County Fairgrounds this time around. He bolted free from the start aboard his No. 1 Indian Motorcycle Rogers Racing SDI Scout FTR750 and left the pack to sort out the remainder of the positions in his roost around the pea-gravel cushion Half-Mile. Things became considerably more interesting once the only rider to have beaten Mees in a straight fight all year – Jeffrey Carver Jr. (No. 23 Roof-Systems of Dallas/Indian of Metro Milwaukee Scout FTR750) – took over second place and put Mees in his sights. Carver successfully whittled away at the lead, slashing it from around two seconds all the way down to less than eight tenths just past half-distance. Mees was ready with a response to Carver’s charge, slicing through traffic just as Carver’s desperate bid for a come-from-behind win eventually took its toll on his endurance. Mees not only blunted Carver’s charge but regained his advantage to ultimately claim the checkered flag with a 2.738-second margin of victory. Jared Mees had Lima’s pea gravel cushion circuit figured out pretty much all day long on Saturday. Even though Carver was unable to track down and overhaul his rival, earlier in the program he managed to win the last-ever George Roeder Dash-For-Cash. The prize money he was awarded following the four-lap sprint race waged by the top six AFT Twins qualifiers likely made his runner-up result a bit easier to accept. Henry Wiles (No. 17 Bandit Industries/Wilco Racing/Willy Built Indian Scout FTR750) continued his remarkably strong and consistent 2018 campaign by finishing third. The result marked his fourth podium and eighth top five of a season. In order to do so, Wiles was forced to chase down and overtake 2017 Lima Half-Mile winner Briar Bauman (No. 14 Zanotti Racing Indian Scout FTR750). Bauman held on to claim fourth while Brad Baker (No. 6 Indian Motorcycle Racing backed by Allstate Scout FTR750) recovered from a rough start to take home a fifth-place result. Fan favorite Shayna Texter (No. 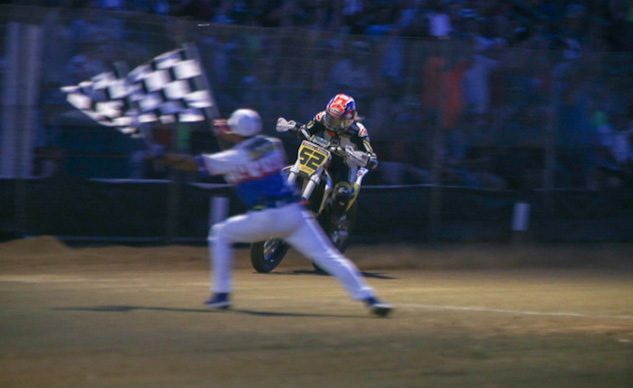 52 Husqvarna Motorcycles/JCS Racing FC 450) made history on Saturday night at the Indian Motorcycle Lima Half-Mile by delivering Husqvarna’s first American Flat Track victory. Texter, who holds the all-time win record for the AFT Singles class, had been repeatedly knocking on the door of that momentous achievement for weeks now. Coming into Lima she had logged four podiums aboard her rapidly-developing Husqvarna FC 450, including a pair of runner-up finishes. 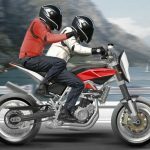 Those results lent the long-awaited maiden Husqvarna triumph a certain sense of inevitability, but when she finally did break through, she did so with panache. Texter pulled a disappearing act on the opening lap and piled it on from there in an AFT Singles Main Event that was never really in doubt. After taking the checkered flag with a full 4.765 seconds in hand to become the class’ seventh different winner in 10 races this season, a jubilant Texter said, “It’s so cool… It’s so awesome! To get Husqvarna their first win in American Flat Track is a dream come true… Hats off to my entire team and everyone who has been behind me. It’s been a long year, and I’m so happy to finally get this one. Shayna Texter not only scored her first win of the 2018 season, she gave sponsor Husqvarna its first-ever American Flat Track victory – and in convincing fashion. 2016 AFT Singles Champ Ryan Wells (No. 94 RMR/Al Lamb’s Dallas Honda CRF450) finished second on Saturday night. Wells battled for the position with defending class champ Kolby Carlile (No. 1 Estenson Racing/McCandless Truck Center Yamaha YZ450F) before Carlile saw his race end early due to a mechanical. Dan Bromley (No. 62 KTM North America/Bromley Motorsports 450 SX-F) earned the final spot on the podium following Carlile’s premature exit by slashing his way forward throughout the contest. Bromley was mired in tenth off the start but rebounded nicely to claim his eighth podium of 2018. Reigning Flat Track Canada Champion Brodie Buchan (No. 149 Buchan Racing/Parts Canada Honda CRF450R) took fourth, followed by last year’s race runner-up Kevin Stollings (No. 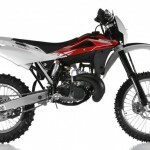 99 Roof Systems Honda CRF450R) in fifth. Bromley continues to have a firm grasp on the AFT Singles title fight as it enters its second half. Following tonight’s result Bromley has 178 points to Wells’ 135 and Texter’s 134. American Flat Track will be back in action next weekend for the Harley-Davidson New York Short Track at Weedsport Speedway, in Weedsport, N.Y., on Saturday, July 7. Live coverage can be viewed on FansChoice.tv beginning at 4:00 p.m. ET with Opening Ceremonies scheduled to kick off at 6:45 p.m. ET. Tickets are on sale now and can be purchased at New York Short Track Tix. And don’t forget there’s a free Kickoff Party happening at the track on Friday night, with a very special Trading Places event involving Jared Mees and Weedsport GM Jim Phelps, who will trade race vehicles for some entertaining laps – Mees in Phelps’ Dirt Mod racecar and Phelps on Mees’ backup Indian FTR racer.